A few simple ingredients take Parmesan Marsala Sauteed Kale to the next level. 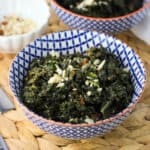 Kale sautés in a Marsala wine and Parmesan mixture with a little bit of cream for a flavorful, ultra satisfying side dish. Rinse and prep kale. Add 3 tbsp olive oil to a large skillet and heat over medium to medium-high heat. When the oil is hot, add minced garlic and saute for 2 minutes, or until garlic is turning golden. Add as much kale as can fit in the skillet comfortably. Stir the kale around as it wilts. When more room frees up in the skillet, add additional kale in batches, adding a little drizzle of olive oil additionally if needed. Continue until all kale is in the skillet. Season kale with salt and pepper. Once all of the kale is in the process of wilting, add Marsala to the skillet and stir, scraping up any bits of garlic that may be stuck to the bottom of the skillet. Let kale cook for 3-4 minutes as the Marsala begins to reduce. Reduce heat to low and add the cream and Parmesan cheese. Stir. Let kale cook for an additional 5-6 minutes (or longer) to absorb the flavor, stirring occasionally, until all kale is soft and wilted. Serve as it is, or with almonds sprinkled over top (optional). To prep the kale: You'll want to discard (or use in some other way) the thick, center stem from each leaf of kale. To streamline this process, I gather all of the leaves towards each other to one side, making it easy to slice away the stem. Then I give the leaves a few slices and they're ready to use. Substitutions: In a pinch I've subbed in some sherry cooking wine when I didn't have a full 3/4 cup of Marsala. I've also used half-and-half instead of cream on occasion. Great either way!